I continue to show you how to make a Content Gallery in this tutorial. 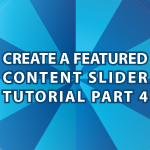 I’ll focus on how to allow for multiple blocks of content in this tutorial and how to set up arrows to cycle through that content. This tutorial was ment to originally create a WordPress specific Featured Content, but now it will work on any type of site. If you missed the previous parts check out WordPress Featured Content and all of the other parts that proceed this one. And, an insane amount more! Remember this isn’t the end. I still have to add a light box feature and then have everything work as a WordPress Plugin! how to implement Twitter-Like “Load More” Widget with java technologies. I’m sorry, but i don’t understand. Can you point me towards an example of what you want?